After the Jalbert show I found myself once again at the Knight Library (Nike sponsored?) looking through the photo stacks. The thing that makes a library qualitatively different than a bookstore is that most bookstores only shelve titles that are currently in print. Yes, used bookstores carry out of print books but even then the selection is limited. The really old stuff gets sold for scrap or given away or who knows what happens to it. But a library...a library never rarely has to dump anything old. In fact it's their job to hang on to it to keep an archive. The Knight Library is filled with obscure photographic journals from the mid 20th century on up to the present, and the book collection is massive. Up until about 15 years ago a library could actually buy just about every photo book published, and the U of O seems to have done that. 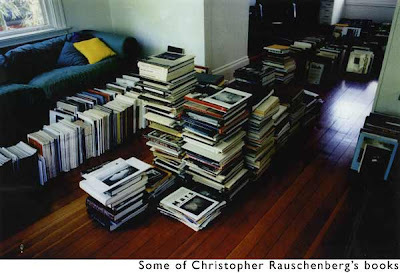 It probably has the most comprehensive selection of photo books in Oregon outside of Rauschenberg's den. You can learn a lot looking at older photo publications. 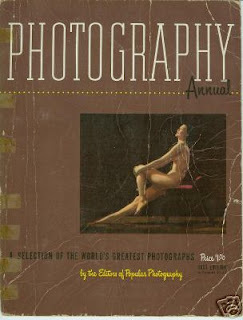 I glanced through some Popular Photography magazines from the 1950s. Their message wasn't much different than what it is today: "Buy this gadget and your photos will improve!" The publications which seemed the most dated were compilations from the late 1960s and early 1970s. Black and white images heavy on the double exposures and alternative process, usually heavy on the nature imagery. I guess they were all copying Uelsman but with less skill. Boy does that stuff age poorly. What were they thinking? Looking through some of these compilations brought up the inevitable question: Which photography being made today will seem dated in the future and which will be timeless? Which is sort of a cheap question to ask about photography because every photo is dated. That's its nature. I guess my question is, which photos will seem hopelessly stylized and thus trapped in an era? Could it be that the large canvas color prints seen in every photo gallery nowadays are a passing fad? One book I found today which definitely does NOT seem dated is American Independents, edited by Sally Eauclaire. This is the third in a series of color photography compilations published in the 1980s by Abbevillle. Considering that the series is 20 years old it's incredible how fresh and alive the photography is. All three books are absolutely essential guides. The photography is dynamite, the printing is fine, but what is most impressive is Eauclaire's selection of photographers. It's a who's who of serious contributors to the medium. 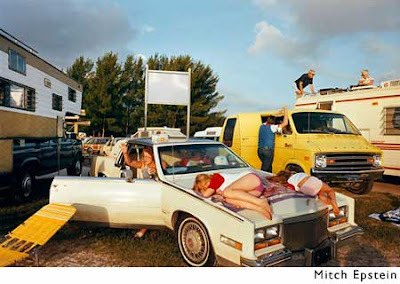 American Independents has Eggleston, Epstein, Jenshel, McGowan, Mertin, Meyerowitz, Misrach, Shore, and Sternfeld, among others. About one in two selected is a big time stud. Considering that she was choosing photographers in the early 1980s before color photography had really taken off, it's impressive that her hit count is so high. Who could know back then which of these folks would be flashes in the pan and which would stick? By comparison most of the journals I mentioned earlier compiling photographers of the 1960s and 1970s are horrible at predicting serious contributors. They are filled with forgettable photos by forgettable photographers. Eauclaire's task wasn't easy but she nailed it. The photographer I find most impressive in American Independents isn't one of the big studs. It's Stephen Scheer. Who is this guy? I can't help thinking his name got confused with Shore and so he was forever overshadowed. Whatever the case, he is an incredible photographer, with a natural street photographer's sense of spacing, of the moment, of color, and an uncanny sense of how to stick dynamic elements together into a photo. The only place I've seen his work is in these guides. As far as I can tell he's published nothing else, although he did have a small portfolio in Aperture #91 (which has Michael Spano too. Bonus!) According to the endnotes he studied with Papageorge, had a Blue Sky show in the 1970s, and then...what? I repeat, who is this guy? I find it amazing that someone of that talent can return zilch on a Google search for his images. I think the fact that he's relatively obscure is part of his appeal for me. Well, there's some lag time (14 months) between your original post and this comment. Better late than never. I've got 'new Color/new work', the second of Euclaire's three compendia (?) of early color photography. It's got some good stuff in it. Did buy a copy of 'American Independents' but returned it. Found it profoundly uninteresting. The test is whether I would go back and graze visually in a book again and again. Yes to that for 'new color' but no to this other book of Euclaire's. I'd like to get her original book.